I've just updated my Novel, and I spent a couple hours playing with it. Coincidentally, I'd pulled it out of the box yesterday because I was going to try to gain root access. I used it for a while yesterday, and this new firmware is a significant improvement. The firmware is dated July 4th, but they didn't post it until Tuesday morning (I checked Monday). I still had to do a second hard reset to get the touch screen to respond correctly. The screen is noticeably more responsive. I don't have to press+hold+wait anymore. Just tapping the screen is enough. Response is still a little on the slow side, though. They fixed the Wifi. It also seems to be faster at connecting to a hotspot. Load time on the browser is reasonably fast. The Reader and Library are still slow at turning the page, though, and you still have to swipe. The accelerometer works now (all 4 directions). It works automatically in both the Reader and the web browser. Browsing in landscape mode is quite pleasant. It's not so nice to read in landscape mode because you only have the one column of text (it's too wide). Also, it doesn't properly reformat the text when switching from portrait to landscape mode. You have to put it in suspend mode and then turn it back on. It's a decent tablet now that it has the new firmware. But I wouldn't recommend it as an ereader just yet because the page turn is too slow. Also, the Nook Wifi is only $149, and the Nook firmware is significantly more polished. Could you post a video, or link to one showing the updated firmware. Would be greatly appreciated. Thanks! I’m uploading them right now. No, they didn’t add any new reading features. Thanks for your valuable videos and answer of my question! 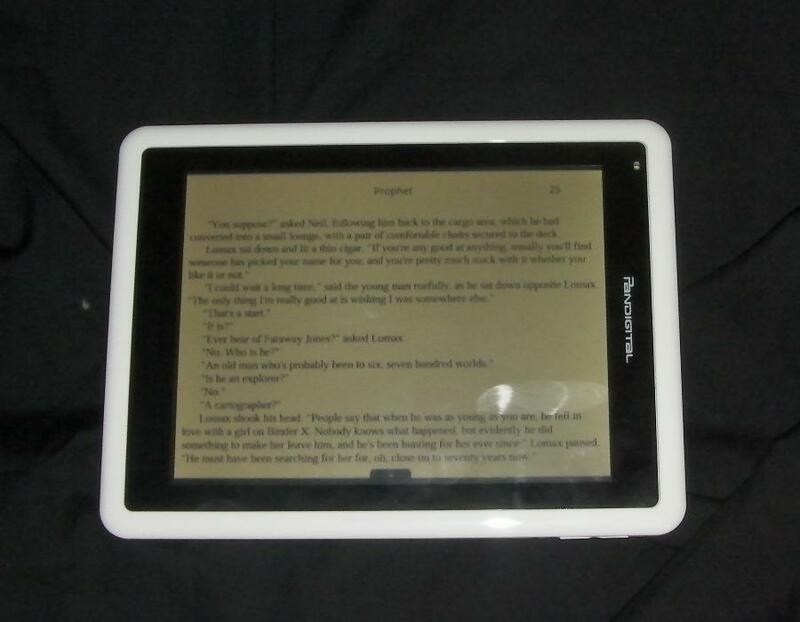 By viewing the current situation, I should not wait for PDN, and chose Nook/Kindle for me. picked up the Novel yesterday. local Kohl’s store received a small shipment by UPS. have to say….i love it. just use my old stylus from an old phone. it responds well and gets the job done as an ereader. wifi works. accelerometer works. seems fine to me. just don’t expect an ipad w/ capacitive screen……..not what it’s meant to be anyway. basically is a digital frame and ereader w/ mobile web thrown in. is great to have on the nightstand! I own (6) readers and I’m happy with my Novel. The Nook with it’s small touch screen and Wi-Fi/3G really drains the battery. Novel is a nice size for MP4 videos also. I don’t have a Kindle and won’t since I don’t buy books, and Kindle doesn’t work with “Overdrive” used by the (3) major library systems in Ohio. I’ve had my Novel for a couple of days. I also own a Kindle. With the Kindle I am completely limited to Amazon. With the Novel I am less limited but I do not seem to be able to use it with “Overdrive” either. That is a setback for me but hopefully, since Novel is still working out it’s bugs, it will be available in the future. I am not disappointed in the page turning at all. But I have had the adobe in eread freeze several times. Small setbacks so far as I am still in the learning curve. Overall, I am pleased with it. I just updated the pandigital novel via my old pc (this ereader is not Mac friendly) and I keep getting an “enter your name and credit card” box when I try to read books I have downloaded from the library. I have tried entering my name and cc # to no avail. I am irritated that I cannot finish the book I started. Anyone else having this problem? Anyone have a fix or know what I should do? Thanks! Hi sir I replaced my US firmware by canadian one which is faster but during pdf reading only one page you an read you can’t move to next page any solution?? Also after that I tries to install barebone firmware but ony file ended by *.dat without the upgrader software so I failed to install!!!!! can you help me? ?